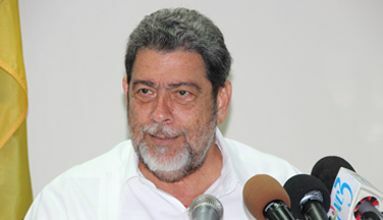 Gonsalves spoke of the US$6.4 million âsoft loanâ from the IMF, pointing out that it had generated concerns with members of the SVGTU in regard to the possibility of conditions being put in place that would negatively affect teachers and other public servants. The Prime Minister explained that this particular loan, which falls under the Rapid Credit Facility and the Rapid Financing Instrument, is one that every IMF member country is entitled to. âEach country has a certain number of allocated Special Drawing Rights (SDRs) which are denominated in US dollar equivalencies,â he said. Gonsalves also referred to a letter he had penned to IMF managing director Christine Lagarde, requesting access to the aforementioned soft loan. Originally, member countries were permitted to draw down under 75 per cent of their SDRs without conditionality. However, new emerging nations pressed for the permission to go beyond 100 per cent of their SDRs – and were granted up to 120 per cent. âIt is our right as members of the IMF to get those monies without conditionality, so long as we do not exceed the 120 per cent in the aggregate of our SDRs,â said PM Gonsalves. He further explained that he drew down funding from the IMF in June 2011 to foot the cost of damages caused during Hurricane Tomas and the April 2011 floods. The Prime Minister said that in early May this year, he had the opportunity to speak with the head of the IMF team that visited while he was out of state about the issues on which the Government had based its loan application. âHe told me that he doesnât see anything difficult with the application because the money which, we had received in 2011 for Tomas and also the April floods… we had used the money very sensibly, and we had reported well on the expenditure,â he outlined. The Prime Ministerâs addressing of this matter came in response to the SVGTUâs call for assurances that the agreement between the Government and the IMF does not interfere with the established terms and conditions for teachers and other public servants.